The Best Of Sanctus Real is exactly that. This is a collection of music that truly showcases what Sanctus Real is all about- not what they were about- they’re not going anywhere, just turning over a new leaf and starting a new chapter. Before they start that chapter, though, they’ve included a brand new single on this album- “Longer Than A Lifetime,” which is the perfect way to close out this era of Sanctus Real’s career. It captures everything the band has been about for the last 20 years- both lyrically and musically. If you’re thinking this is the last we’ve heard of Hammitt, you couldn’t be more wrong- he’ll still write and perform music, just not with Sanctus Real, much like Jason Dunn did when he left Hawk Nelson- don’t worry, Hammitt isn’t going away. 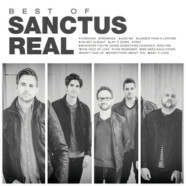 There’s a song from almost ever Sanctus Real album on The Best Of and shows the growth and maturation of the band throughout their career beautifully. If there was any better way to commemorate and celebrate the time Sanctus Real has had with Matt Hammitt at the helm, I urge you to prove it.